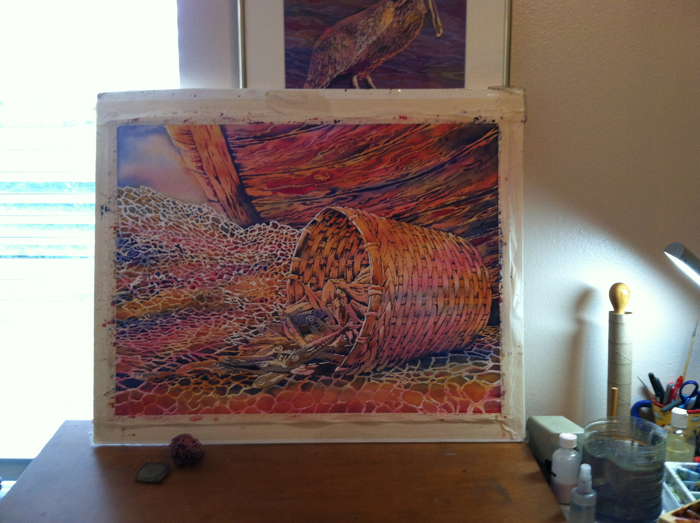 I have been making progress this week, slowly but surely, on the commission painting. 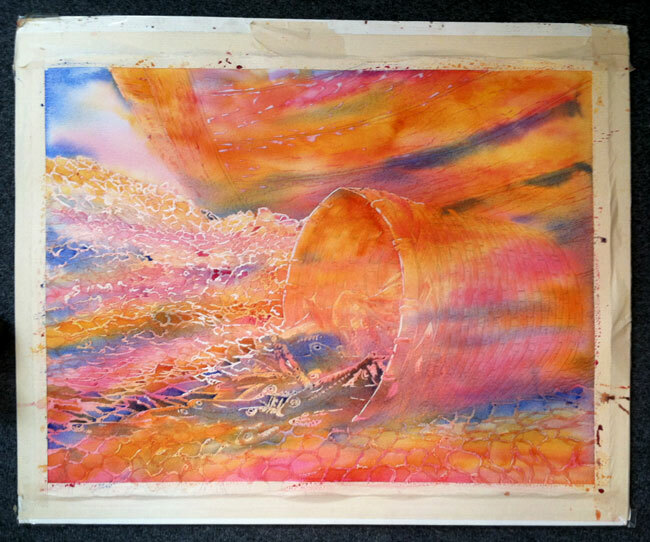 The first few pours of paint are used to establish some of the lighter values. This photo shows the first three pours and the masked areas are ready for the next pour. I will finally be developing more of my middle values. The shapes will really start to pop after the next pour. Here is a close up view of what is going on so far. As I mentioned in the earlier post about this piece, the masking takes a long time to apply. 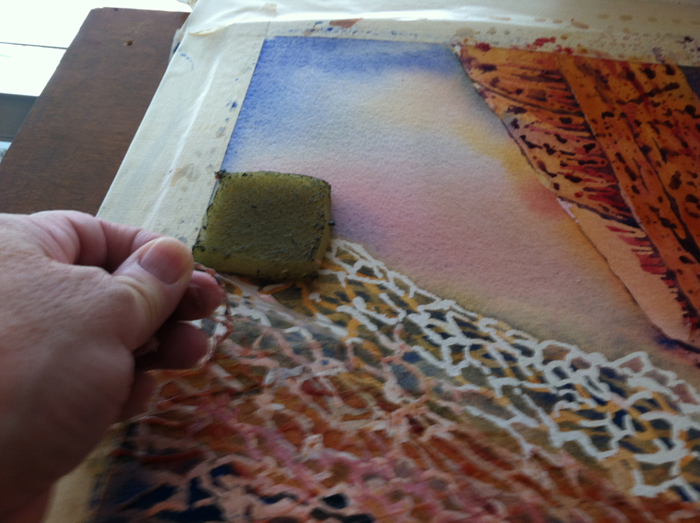 As it is applied and the pigments are poured onto the paper the shapes begin to appear. 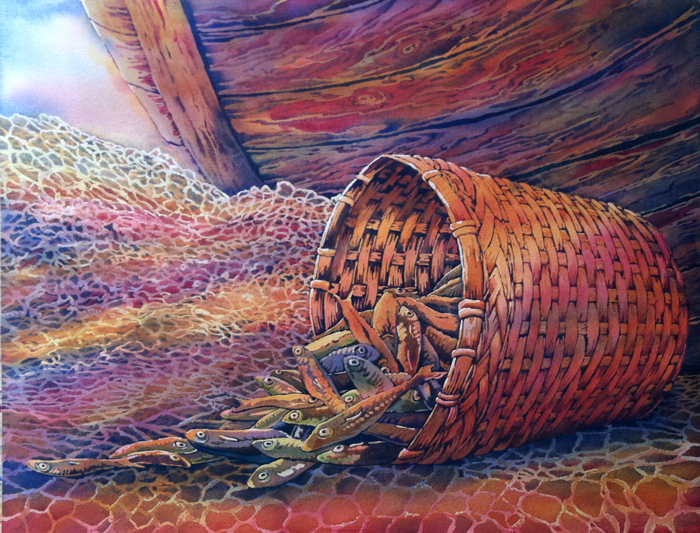 Not sure if you can see the fish falling out of the basket, but they are there. 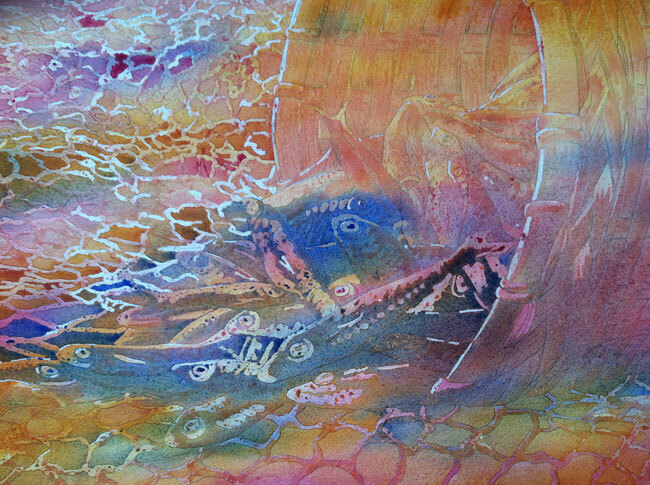 They have a lot of masking applied at this stage so the next pour will be with much darker pigments, revealing more of the shapes of the fish, basket, and boat. I am teaching again. If you live in the Melbourne, Florida area and would like to learn this technique please contact me. I hope to develop some YouTube videos on this technique as well. 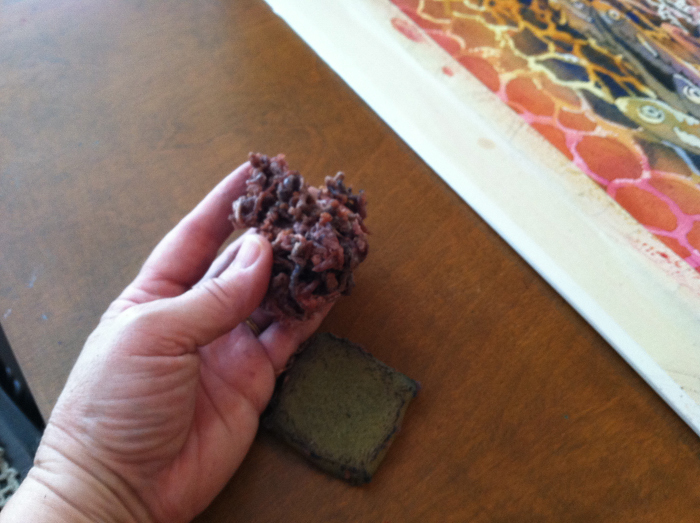 I have several YouTube videos on my other painting methods. 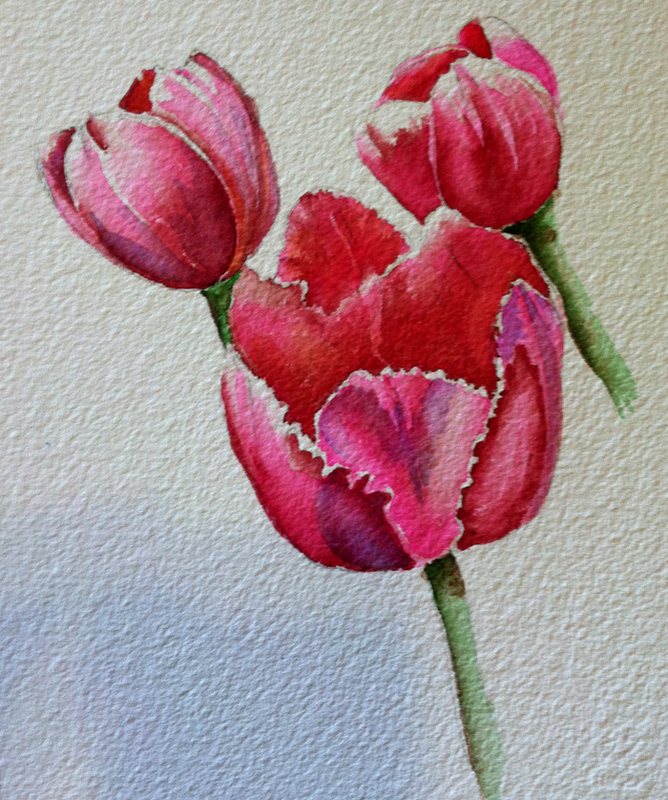 You can see them on my channel: www.YouTube.com/watercolorworks. I finished another “How To” book. This lesson has been very popular because so many people want to learn how to paint shiny surfaces. 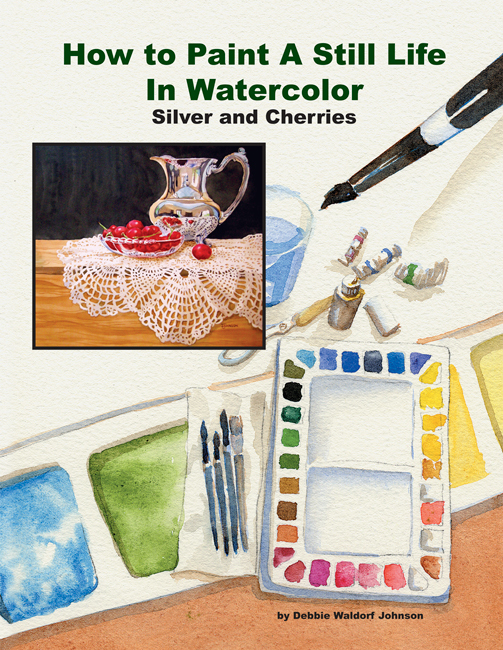 “How to Paint A Still Life In Watercolor: Silver and Cherries” includes information on setting up a still life, using photo references, preparing drawings and watercolor paper and step-by-step instructions on the process. Not only do I cover the reflective surface of the silver, but I also show how to paint a doily, wood grain, and clear glass. I hope you enjoy it. To order your copy click here . I would love to see your finished projects. Another how to paint book is ready for you to enjoy. If you would like to learn to paint transparent and shiny items in a still life this book is for you. 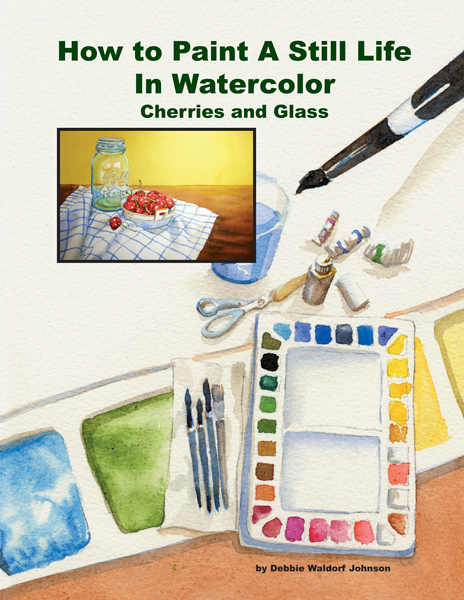 This complete book includes step-by-step instructions on setting up a still life, preparing a drawing, getting your paper ready, and every step of the painting process, including the most basic washes and brush strokes. Each step is described with both words and photos. This was such a fun project. I hope you enjoy it and share your photos of your finished project with me! 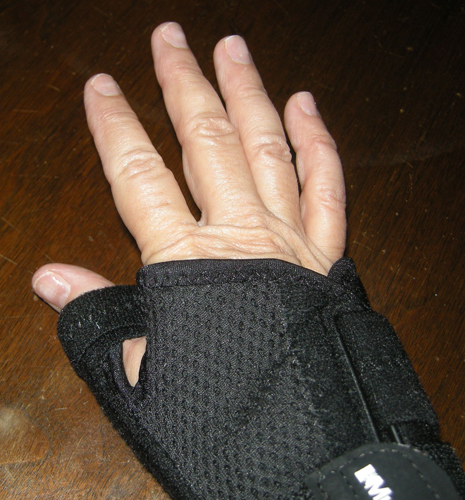 I have a small thumb injury these days and it has been difficult to paint. I wanted to be productive and so I have been working on creating workbooks from some of the lessons I did in the past with my students. 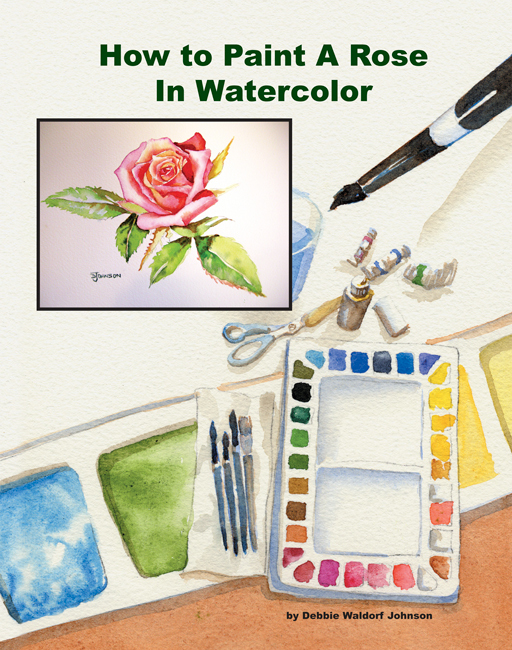 Here is the latest one, which has been quite popular, “How to Paint a Rose in Watercolor”. Click here to order your copy! I hope you enjoy this lesson. It includes everything you need to complete the lesson, plus over 20 pages of detailed instructions on setting up and painting through the picture. Photo references and the final illustration are also included. In the margin at right you will see I have other lesson books available. I’m working on another, so watch for it to be available soon.